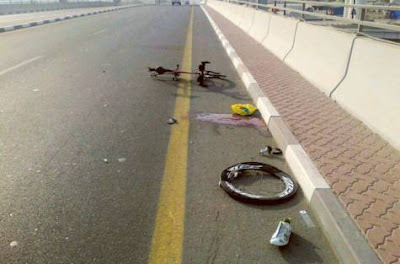 A top Lebanese triathlete in Dubai was killed in the wee hours of yesterday morning by a drunken driver. I did not know Mr. Nasr personally but as a recreational athlete myself, I can relate to how saddening and frustrating it is for the local sporting community to deal with reckless drivers. Incidents are preventable, not just in considering that root causes are related to alcoholism, but the sheer ignorance and poor decision making skills that prevail in these cases. As more expats flock into Dubai each year and recreational sporting activity booms alongside the burgeoning volume of vehicular traffic, it is only a matter of "when" for another fatal vehicle-cyclist accident to occur. I'd like to offer a few suggestions on turning this situation around before someone else dies on the road. First, as the governing authority of public transportation and its standards, Dubai RTA needs to closely analyze how driving schools are offering instruction to new drivers especially on the topic of pedestrian safety. I'm not stating that this isn't being done but somethings are obviously left to desire. Personally, when I attended an 8 hour lecture course at local driving school (name withheld), I noticed that very little time was spent by the instructor in talking about sharing the road with walkers, runners and cyclists. I just don't see how this could dramatically increase the costs of delivering instruction if it can only be emphasized a bit more with the existing system. In high traffic streets in Dubai, one offense that's commonly noticed is that drivers with the goal of taking a right turn will speed past a cyclist (who also happens to be just meters from the start of the turn) without any sort of defensive judgement on their part. The cyclist behind the vehicle now has to brake hard to avoid collision which leads to a number of other unforeseen things. Backing out of an angled or 90 degree parking spot without checking rear mirrors for a pedestrian are also common offences. It is unfortunate that everyone in a car these days seem to be in a dangerous hurry to go places. These folks can avoid a journey to jail and hefty fines by taking necessary precautions. When exiting at a T-junction to enter a road with traffic going right, drivers can be caught only looking to the left of their shoulder to check incoming traffic while they neglect the right to see if a pedestrian is coming along. Safety emphasis should not be prioritized for just non-commercial learner drivers. I have to be brutally honest in pointing out that in my experience, one of the main segments of speeders on the road are none other than RTA Taxi drivers! This should be no secret to the folks who regularly take taxis as part of their commute. Its perplexing how a uniformed agent of public transport can accelerate and change lanes so recklessly without as much as using indicators. I've experienced this several times as a passenger in the backseat and if I weren't so verbally challenged, I'd have been scolding these guys and lodging a complaint to the RTA Taxi Hotline that my ride was nerve-racking. Besides reckless lane changing, some of these taxi drivers can also be seen accelerating hard on straightaways on internal residential streets. I caught one just yesterday and I tell you, this individual could easily have been topping 70kph! Now the only missing item in these residential areas is that there aren't signboards indicating that children could be at play. Should a child come running out of a building and we have this taxi driver moving about like a bat out of hell, you can only imagine which one will live to tell the tale. To me, the RTA safety system has failed if taxi drivers are the ones executing such dangerous maneuvers on our streets. Please take a closer and finer look at the licensing procedures of these taxi drivers. Obviously many other schemes can be looked at to increase awareness towards pedestrians like painting lane markers for cyclists and lighting up the zebra crossings in low visibility areas. Really, these should only be a fraction of the cost of putting up lavish high rise buildings. Let us continue working towards increasing the livability standards of this city by keeping the streets safe from reckless drivers and attacking the roots of preventable problems.